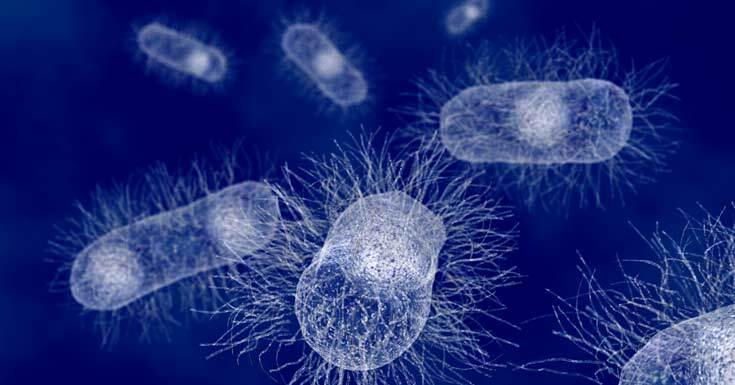 Escherichia coli bacteria is normally found in the intestines of healthy people and animals. Most varieties are practically harmless and only cause relatively brief diarrhea. However, there are strains like the E. coli O157: H7 which are dangerous and can cause severe abdominal cramps, vomiting and bloody diarrhea. 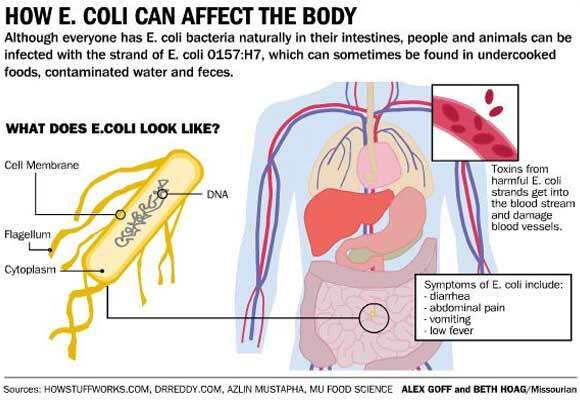 Exposure to E. coli may be from contaminated water or food especially raw vegetables and undercooked beef. What Are the Signs and Symptoms of E. Coli Infection? If you are experiencing persistent, bloody or severe diarrhea, contact your doctor immediately. The cause of E. coli infection is ingestion of a particular strain of the bacteria that produces a powerful toxin that can damage the small intestine lining. This results in bloody diarrhea. Potential sources of exposure include contaminated food and water along with person-to-person contact. Ground Beef – when cattle are slaughtered and processed, the E. coli bacteria naturally found in their intestines can get on the meat. Ground beef combines meat from different animals which significantly increases the risk of contamination. Unpasteurized Milk – the bacteria on a cow’s udder or on equipment for milking can get into the raw milk which is the reason milk needs to be pasteurized. Fresh Produce – stools from cattle farms and other animals can contaminate fields where fresh produce is grown. Particular vegetables like lettuce and spinach are more vulnerable to this form of contamination, so you need to be especially careful about washing them. Humans and animal feces can reach surface water including rivers and streams. The water can also be used to irrigate crops. Many outbreaks have been connected to contaminated water supplies. Private wells are more dangerous because of the lack of a disinfecting system. Rural water supplies are also more likely to be contaminated. Infections can also be acquired from swimming in contaminated pools or lakes. E. coli bacteria can be acquired from personal contact especially when infected individuals do not wash their hands properly. Other family members of young children with this type of infection are most likely to acquire it themselves. Petting zoos and animal barns can also cause outbreaks. E. coli infection can affect anyone exposed to the bacteria, but some people are more likely to develop problems due to certain risk factors. Age – Young children and older adults are more likely to suffer from serious complications. Weakened Immune Systems – People with a weakened immune system from medication or health conditions are more likely to become ill from the ingestion of the bacteria. Eating certain types of food – Risky foods include undercooked ground beef, unpasteurized milk and soft cheeses made from raw milk. Related Video – How Do You Get E Coli? What Tests and Diagnosis Are Required? To diagnose E. coli infection, a fecalysis is required which tests for the presence of the bacteria. It may be cultured for confirmation of the diagnosis and to identify the specific toxins like those that are produced by the E. coli O157: H7. What Are the Possible Treatments and Drugs Available? Avoid taking anti-diarrheal medication because this slows down the digestive system preventing the elimination of toxins. Antibiotics are generally not used because these increase risk of complications. For E. coli infection that has resulted to haemolytic uremic syndrome, hospitalization and supportive care is required. What Precautions and Self Care Should Be Taken? Drink plenty of clear fluids including water, broths and juices. Avoid caffeine, alcohol, apple and pear juices. Add foods gradually but stick to low-fiber foods at first when you are starting to feel better. Start with soda crackers, eggs, toast or rice. Avoid certain foods like dairy products, fatty foods, high-fiber foods and spicy foods which can worsen symptoms especially diarrhea. To prevent E. coli infection, avoid risky foods by cooking hamburgers well. There should be no pink showing in the meat but color is not always a reliable indicator whether the meat is completely cooked. Only drink pasteurized milk, juice and cider. Also, wash raw produce very thoroughly to get rid of any E. coli that can attach in certain spots. Another way to prevent E. coli infection is by avoiding cross-contamination. Wash utensils carefully using hot soapy water especially on knives, cutting boards and countertops before and after coming into contact with raw meat or fresh produce. Raw foods should always be kept separate with separate cutting boards and knives for raw meat, fruits and vegetables. Never use the same plate for cooked and raw meat. Wash your hands before and after handling food. E. coli infection usually resolves itself in a few days. However, if you are suffering from persistent diarrhea or having bloody diarrhea, then it is best to consult your doctor for the appropriate treatment. Prevention is always better than cure so make sure to follow the tips in this article for preventing exposure to E. coli bacteria. Of course, you also need to educate the members of your household on the matter.